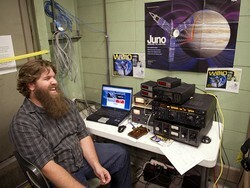 Ham Radio in Space: NASA's Juno Spacecraft Hears Hams Say "HI"
Radiosport: The 2013 ARRL 10 Meter Contest is This Weekend! In a first-of-a kind for an interplanetary spacecraft, NASA's Juno spacecraft in October was able to detect Amateur Radio signals transmitting "HI" in coordinated, very slow-speed CW. More than a thousand radio amateurs around the globe greeted Juno October 9 as it looped past Earth for a gravity-assisted boost on its way to Jupiter. Participants were invited to spread out across 10 meters to transmit "HI" in very slow speed CW (1/25 WPM), sending 30 second dits punctuated by 30 second spaces and 90 seconds between the two characters. 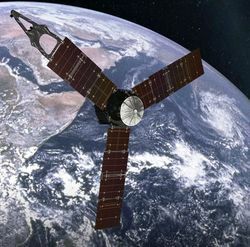 "The second 'HI' was detected clearly," University of Iowa researcher and Waves Principal Engineer Don Kirchner, KD0L, told ARRL, noting that the distance to the spacecraft was about 37,500 kilometers (23,250 miles). "The signals were usually just at or above the noise level, although at closest approach the first three dits of the 'H' had significantly higher signal levels," Kirchner continued. "A possible explanation is that for a short time we were inside the ionospheric waveguide and, as we increased in altitude, went back above it for the last dit." Shortly after that, Kirchner said, the spacecraft went into safe mode, so outbound data were lost. The experiment involved 16 identical transmission rounds or cycles and ran a bit longer than 2-1/2 hours all told (1800 to 2040 UTC). The object of the experiment was to see if Juno's onboard "Waves" experiment would be able to detect the collaborative RF. Spreading out participants on a wide range of 10 meter frequencies was intended to improve the chance of the Waves instrument's hearing the ham signals. The detector has a bandwidth of 1 MHz. According to the University of Iowa, after the flyby the Juno team evaluated the Waves instrument data containing the messages. Kirchner notes that while previous space missions -- Galileo on its way to Jupiter, and Cassini headed for Saturn -- were able to detect shortwave radio transmissions during their Earth encounters, it was not possible to decode intelligent information using the data from those spacecraft. Among stations participating were operators at the Virginia Tech Amateur Radio Club's K4KDJ, who posted video of their activity on YouTube. Kurth said the activity raised awareness of the mission, adding that the University of Iowa already has heard from some who plan to follow Juno through its science mission at Jupiter. On December 10 during the fall meeting of the American Geophysical Union in San Francisco, Kurth and Juno Principal Investigator Scott Bolton of the Southwest Research Institute of San Antonio took part in a news conference to discuss the science gathered during the Juno flyby as well as the success of the "Say HI to Juno" project. University of Iowa Amateur Radio Club President Tony Rogers, AD0EN, sits in the operator's chair of club station W0IO, which was among the stations greeting the Juno spacecraft in October. [Tim Schoon/University of Iowa, photo]. Kirchner said the project originated when public outreach staff at NASA's Jet Propulsion Laboratory in Pasadena, California, wanted to know if the UI receiver was able to pick up a voice message. Kurth and Kirchner came up with the idea that a slow Morse code message might work, and Kirchner enlisted the University of Iowa Amateur Radio Club to get involved, spreading the word via ham radio to raise awareness of the project. Plans call for Juno to orbit Jupiter 33 times. Among a variety of investigations, Juno will explore Jupiter's northern and southern lights by flying directly through the electrical current systems that generate them. NASA's Jet Propulsion Laboratory, which manages the Juno mission for the principal investigator, posted a mini-documentary about the "Say HI to Juno" event on YouTube. "We would again like to thank all amateurs who participated," Kirchner told ARRL. 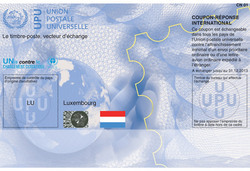 "At last report about 1400 had sent in a request for a Juno QSL." Anyone who took part can request a QSL card that acknowledges their help. The deadline is December 21 to file comments on the ARRL's "Symbol Rate" Petition for Rule Making (PRM). The ARRL filed the Petition last month, and the FCC has put it on public notice for comment as RM-11708. The League subsequently filed an Erratum to correct an incorrect appendix included within the Petition. The Petition already has attracted more than 70 comments. The ARRL has asked the FCC to delete the symbol rate limit in §97.307(f) of its Amateur Service rules and to replace it with a maximum data emission bandwidth of 2.8 kHz on frequencies below 29.7 MHz. The ARRL contends that the changes it proposes would "relieve the Amateur Service of outdated, 1980s-era restrictions that presently hamper or preclude Amateur Radio experimentation with modern high frequency (HF) and other data transmission protocols" and "permit greater flexibility in the choice of data emissions." Symbol rate represents the number of times per second that a change of state occurs, not to be confused with data (or bit) rate. Current FCC rules limit digital data emissions below 28 MHz to 300 baud, and between 28.0 and 28.3 MHz to 1200 baud. The League's petition points out that other radio services use transmission protocols in which the symbol rate exceeds the present limitations set forth in §97.307(f), while staying within the bandwidth of a typical HF single sideband channel (3 kHz). "The symbol rate restrictions were created to suit digital modes that are no longer in favor," the ARRL noted in its petition. "If the symbol rate is allowed to increase as technology develops and the Amateur Service utilizes new data emission types, the efficiency of amateur data communications will increase." A perennial favorite with many operators, the ARRL 10 Meter Contest is again poised to make a splash on the highest of the HF bands. Conditions on 10 meters already look much better than they did in 2012, according to early predictions. In fact, the recent CQ World Wide contests provided many operators with outstanding rates on 10, where the band was busy nearly from end to end. During the 2012 ARRL 10 Meter Contest, Dave, W8NF, tunes for mults on CW, while Chuck, AF8Z, runs on SSB, and Ron, KD7VIK, directs the Tualatin Valley Contesters W7TVC low-power multiop in Oregon. The 10 meter band, of course, is special in that it features Technician class phone privileges from 28.300 to 28.500 MHz. This means that many more operators, including some who are new to contesting or even to HF operating, can take part in the contest and even be competitive. This is a tremendous opportunity for veteran operators to serve as Elmers to the contesters of tomorrow. The 2012 running of the 10 Meter Contest saw an increase in multioperator stations. A few teams were comprised entirely of new operators, a trend indicative of the continued popularity of HF across the US. If you are set up to operate on 10 meters, consider inviting some friends to share the fun by hosting a multioperator effort. NG3K's very useful Announced DX Operations page shows which DX operations, some from rare entities, plan to be on the air during the contest. This should offer plenty of opportunities to fill some 10 meter band slots, or even work a "new one!" The 2013 ARRL 10 Meter Contest starts at 0000 UTC on Saturday, December 14, and runs through 2359 UTC on Sunday, December 15. Logs should be e-mailed to 10meter@arrl.org or postmarked by 0000 UTC Wednesday, January 14, 2014. Mail paper logs to ARRL 10 Meter Contest, 225 Main St, Newington, CT 06111. Upload soapbox comments and photos to the Soapbox page. Contest University Chairman Tim Duffy, K3LR, is predicting a great year in 2014 for Contest University (CTU). For the first time, CTU in 2014 will hold two different all-day sessions, with no overlap or repeats between the two. Each CTU event will feature unique and updated presentations. The first US CTU will be the Dayton Contest University on Thursday, May 15, 2014, at the Crowne Plaza Hotel in downtown Dayton -- the day before Dayton Hamvention®. The Dayton session will offer four classrooms presenting more than 20 all-new presentations by top contesters and station builders. CTU Dayton registration will open soon, and space is limited. The CTU website has more information. In July, the ARRL National Centennial Convention will host the second US CTU. It will take place at the Connecticut Convention Center in Hartford, Connecticut, on July 17, 2014. The ARRL Centennial Convention CTU will be an all-day event with six all-new CTU presentations (no duplication from Dayton) in one classroom. The ARRL is handling registrations for the Centennial CTU. Registration for the ARRL National Centennial Convention and the Convention CTU begins in January. The ARRL Southeastern Division will have a new Vice Director as well as a new Director on January 1. Following balloting in November, Doug Rehman, K4AC, of Mount Dora, Florida, was declared elected to a three-year term as Director, and incumbent Vice Director Jim Millsap, WB4NWS, an appointee, defeated one challenger to win a new, full term. A subsequent change in Vice Director Millsap's job responsibilities has made it necessary for him to resign, effective January 1. In accordance with the ARRL Articles of Association and after consultation with the Director-elect, ARRL President Kay Craigie, N3KN, has appointed Michael Lee, AA6ML, of Palm Coast, Florida, to fill the Vict Director vacancy. Lee currently serves as the Northern Florida Section Emergency Coordinator. 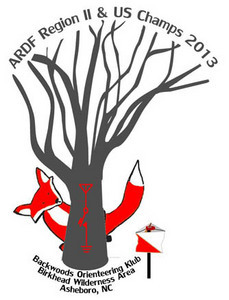 Nearly 50 radio direction finding enthusiasts took part in the 13th USA Amateur Radio Direction Finding (ARDF) national championships, held in the Uwharrie National Forest near Asheboro, North Carolina, in October. This year's weeklong US competition was combined with the Seventh ARDF Championships of IARU Region 2 (the Americas). ARDF competition rules are established by the IARU. "The object is always to find as many of the required transmitters as possible in the shortest time and then navigate to the finish line, using only one's own direction-finding equipment plus a compass and the provided map," explained ARRL ARDF Coordinator Joe Moell, K0OV. "There are classic competitions on separate days on the 2 meter and 80 meter bands, with up to five transmitters in an area of about 1000 acres." Moell said the competition included two new events, both on 80 meters. "The sprint is a shortened course with 10 transmitters and a faster transmitter cycle," he explained. "Foxoring is a combination of orienteering and foxhunting, in which competitors receive maps marked with the approximate locations of a dozen very low-power transmitters that they are to find. Competitors are divided into six age categories for males and five for females, with medals awarded to winners in each category." As in many European countries, the US national championships are open, meaning that visitors from other countries are welcome. Visitors compete for individual medals in an overall division that includes everyone. This year, visiting competitors came from China, Germany, Russia, Sweden, Ukraine and United Kingdom. Stateside radio-orienteers enjoyed comparing notes with them on ARDF equipment and techniques. 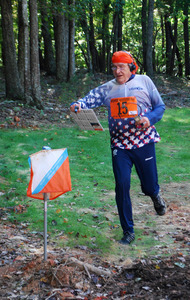 Complete results of all events are available on the Backwoods Orienteering Klub (BOK) website. More than 90 photos have been posted on Moell's Homing In website, which includes much more information about the growing sport of ARDF. Plans are already underway for next year's national championships. These are expected to take place in early June, in time for selection of ARDF Team USA, which will travel to Kazakhstan for the 17th ARDF World Championships in September 2014. "A maximum of three competitors in each age-gender category may be on a nation's team," Moell pointed out. "They will be selected from the best performers at the 2013 and 2014 USA Championships." Read more. The Great South Bay Amateur Radio Club (GSBARC) earned a spot on a plaque honoring first responders and other volunteers who assisted in the wake of the devastating Superstorm Sandy and the nor'easter that followed in the fall of 2012. 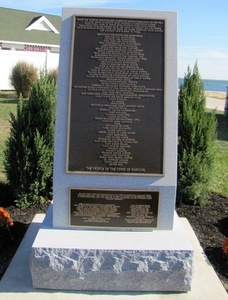 The Town of Babylon, a township consisting of several communities on Long Island, New York, erected the plaque earlier this fall in Tanner Park in the village of Copiague. The park, which faces Great South Bay on Long Island's south shore, suffered serious damage from the storms. The plaque reads, "When the Town of Babylon was struck by Superstorm Sandy in the fall of 2012, many residents were exposed to dangerous storm conditions; some of whom were rescued from their homes. These brave men and women were the first to answer the call when their neighbors needed them the most. We thank them for their service and dedicate this plaque to them." According to GSBARC spokesman Bob Myers, K2TV, the recognition "came as a complete surprise" to the club, most of whom also belong to the local ARES organization. "They were only carrying out what they felt was expected after the many hours of training and emergency preparedness," he said. "Having recognition like this serves as validation that they were doing their job." ARRL Hudson Division Director Mike Lisenco, N2YBB, thanked the town "for recognizing our efforts" as well as all those GSBARC and ARES members who helped after the storms. "May we keep ever vigilant and prepared as communicators, helping out any way we can," Lisenco added. He pointed out that GSBARC is the first volunteer organization the plaque lists. To commemorate the life of the late former president of South Africa Nelson Rolihlahla Mandela, the South African Radio League (SARL) is sponsoring special event station ZS9MADIBA for a period of 30 days. 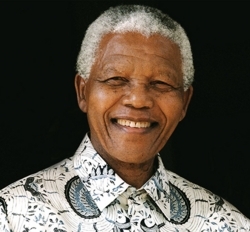 "Madiba" is Mandela's Xhosa tribal name. Mandela, who served from 1994 until 1998 as South Africa's first black president, died December 5 at the age of 95. "The South African Radio League, its council and members join the world in mourning the loss of South Africa's greatest statesman, Nelson Rolihlahla Mandela," the SARL said on its website. "Let us continue to remember and be encourged by the so many positive things for which he stood. While we mourn his passing, we celebrate his life and the lessons he taught us and the world." As the VU7AG Lakshadweep Islands DXpedition was winding down, its leader, Krish Kumar, W4VKU, took time out to talk to students on Agatti Island about telecommunications and Amateur Radio. The classroom presentation fulfilled a goal of a Colvin Award, which helped to fund the DXpedition, to enhance the condition of Amateur Radio in the DX location. 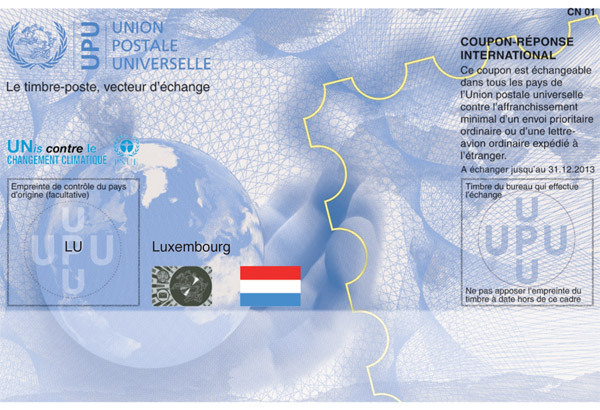 The VU7AG operation has been approved for DXCC credit. Kumar said his presentation covered the Internet, the mobile phone system, and the role of radio and Amateur Radio. "I have a PowerPoint [presentation] that talked about the Internet, the routing of data, the way the phone systems are tied, and how the kids can play with Amateur radio," Kumar told ARRL. He also left behind an "old, but good" copy of the ARRL's Now You're Talking for the school library. "We did two sessions for the 11th and 12th graders. This was followed by an on-the-air demonstration." Kumar also purchased a DVD of the PBS series "The Universe" for the school. "The principal was very happy with the event," Kumar added. The VU7AG DXpedition, which got underway November 20, wrapped up December 10. Logs will be uploaded to Logbook of The World (LoTW). The VU7AG team logged 55,304 contacts. 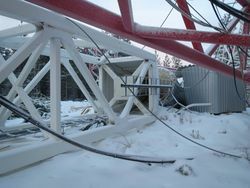 Stormy weather has taken down major ham radio antenna towers in Finland and Denmark. On December 6, Radio Arcala (OH8X) reported that its 330 foot tall tower supporting massive 160 meter and 80 meter Yagis literally fell victim to high winds that also took out power to some 200,000 homes in Finland. The downed OH8X tower in Finland. "The mammoth structure collapsed peacefully, not hitting any of the other six towers, not hurting people or damaging buildings," a report from Jarmo J. Jaakola, OH2BN, described. "As professional engineering efforts had up to now ensured the survival of this 5 year old structure, inspectors are busy trying to evaluate the cause of the failure. It is suspected that automation designed to enable the array to find its most comfortable position in high winds somehow locked up and caused the structure to corkscrew." In Denmark, the same storm bent over the top of the OZ5E contest station's tower supporting a 20 meter OptiBeam and 3 element 40 meter Yagi -- "a total loss," the Danish Contest Academy reports on its website. The Daily DX this week relayed a report from Rick Dorsch, NE8Z, that Monk Apollo, SV2ASP/A, lost all of his antennas, including a SteppIR beam, in the windstorm. SV2ASP is the only station active on HF from the DXCC entity of Mount Athos. The ARRL DXCC Desk has approved the 2013 operation of 9X0XA -- Rwanda for DX Century Club credit. If a request for DXCC credit for this operation has been rejected in a prior application, contact ARRL Awards Branch Manager Bill Moore, NC1L, to be placed on the list for an update to your record. Please note the submission date and/or reference number of your application in order to expedite the search for any rejected contacts. The Boy Scouts of America reports the number of stations taking part in the 2013 Jamboree On The Air (JOTA) was up by 33 percent to 271, although the number of Scouts reported on the air was down by 25 percent to nearly 14,000. All the statistics still may not be in, however. The number of Amateur Radio operators involved in JOTA 2013 rose from 1000 last year to nearly 1300 in 2013. "The number of stations that registered prior to the event hit a new record of 419, but quite a few just didn't provide a report after the event," said Jim Wilson, K5ND, the national JOTA organizer and chairman of the National Radio Scouting Committee. "So, we're hopeful that the number of Scouts actually continued to increase." According to the JOTA report, some JOTA groups "made very creative use" of two contests on the air that weekend, taking part in the events -- the Worked All Germany Contest and the New York QSO Party. "They essentially entered the contest, set up the exchange information, and allowed the Scouts to work rapid-fire contacts in full contest style." Worldwide last year, nearly 700,000 Scouts took part from more than 6000 Amateur Radio stations in 150 countries. The JOTA 2013 report and a summary video are available on the K2BSA Radio Scouting website. Former NASA Astronaut Susan J. Helms, KC7NHZ, has renewed her interest in ham radio, and, as of November 26, has her old call sign back. A lieutenant-general in the US Air Force, Helms now is the senior officer at Vandenberg Air Force Base in California. 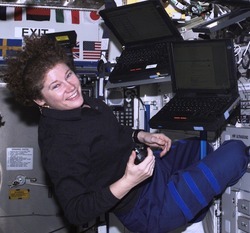 Due to pressing Air Force duties, she allowed her license to expire in 2005, but when the Satellite Amateur Radio Club (W6AB) hosted a 2013 Boy Scouts Jamboree on the Air (JOTA) activity for several local Scout troops, Helms's interest returned, and she took and passed the Technician examination during a test session at the event, obtaining KK6HNZ -- which coincidentally contained the same three letters as her old call sign's suffix. When England's east cost was struck by a devastating flood in 1953 that claimed more than 300 lives, evacuations were hindered by a lack of effective communication. Amateur Radio volunteers filled the gap, but at the time the UK had no volunteer emergency communication corps, such as ARES in the US. Previous attempts to establish such an organization ran into governmental roadblocks, but after the East Coast Flood, RAYNET -- the Radio Amateurs' Emergency Network was inaugurated in November 1953. Today RAYNET's 2000 Amateur Radio members serve as the UK's premier volunteer communication group. To advance emergency communication as well as Amateur Radio, RAYNET and the Radio Society of Great Britain (RSGB) have a formal agreement to work together. Tad Cook, K7RA, in Seattle, Washington, reports: Solar indicators rose over the past week, with the high points being a sunspot number of 169 and solar flux of 175.2 -- both on Tuesday, December 10. In an otherwise quiet week, the planetary A index reached 26 on Sunday, December 8, sparked by a strong solar wind surging from a coronal hole. We could see a repeat this weekend, although it is predicted to be weaker. The planetary A index during the ARRL 10 meter Contest this weekend may be a bit more active than contesters would like, with predicted values of 10 and 18 on Saturday and Sunday. Compared to the previous 7 days, from December 5 to December 11 the average daily sunspot number rose from 102.9 to 122.1, and average daily solar flux increased from 132.9 to 162.4. The predicted values in the 45 day solar flux outlook took a substantial leap on December 8. On December 7 the predicted average solar flux for December 10 to December 15 was 141, but on December 8 the projected average for the same period was 170. The predicted values for the following 45 days increased across the board, but have since scaled back somewhat. The latest prediction has solar flux at 168, 165 and 160 on December 12-14, 155 on December 15-16, 150 on December 17-18, 160 and 170 on December 19-20, 172 on December 21-22, 175 on December 23-25, 172 on December 26, 170 on December 27-29, 165 on December 30, and 160 on December 31 through January 2, 2014. Predicted planetary A index is 5 on December 12-13, and then 10, 18, and 8 on December 14-16, 5 on December 17-25, then 12, 10, and 8 on December 26-28, and 5 on December 29 through January 2, 2014. Don't miss the ARRL 10 Meter Contest this weekend, getting underway at 0000 UTC on December 14 and continuing through 0259 UTC on December 15. Predicted solar flux shows this year's 10 Meter Contest may benefit from the highest solar activity since the 2002 event, when solar flux values were about 25 points higher than now. Conditions may be similar to 1999, when solar flux was about the same as it is now. This was before the peak of the last solar cycle.